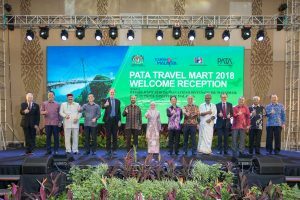 Langkawi (Malaysia) – September 16, 2018 (travelindex) – PATA Travel Mart 2018 (PTM 2018), hosted by Malaysia, has attracted over 1,400 delegates from 70 global destinations. The delegate numbers embraced 389 sellers from 208 organisations and 33 destinations with local sellers comprising 32% of the total, along with 252 buyers from 241 organisations and 53 source markets. The Pacific Asia Travel Association (PATA) was also pleased to welcome 210 local and international young tourism professionals including PATA Student Chapter members from Bangladesh Dhaka University, Canada Vancouver Capilano University, Malaysia Taylor’s University, Nepal, Philippines LPU-Manila, and Singapore Temasek Polytechnic. The students were part of the PATA Youth Symposium held on Wednesday, September 12, hosted by the Langkawi Development Authority (LADA) and the Alumni Association of UiTM Students’ Representative Council (PIMPIN) in collaboration with the PATA Malaysia Chapter, Tourism Malaysia and Langkawi UNESCO Global Geopark. During the event, Travelindex and Snap Productions launched, at the LADA Langkawi Development Authority booth, the most comprehensive tourism website on Langkawi at VisitLangkawi.net The launch was presided by Ybhg. Dato’ Haji Azizan Noordin, CEO of LADA and Mr. Anthony Wong, Group Managing Director of Frangipani Hotels and Resorts.